This should be a great presentation, and it’s freeeee! Those of you who have been following the news on the last West Coast lumber schooner C.A. Thayer are probably aware that it is currently in Alameda at Bay Ship & Yacht Company, currently receiving her masts and standing rigging. This is exciting news as she’s been sitting for years at Hyde Street Pier, unrigged. While she went through a major restoration of her hull many years ago, what’s a sailing ship without masts? She’ll be home soon and ready for the remaining rigging and deckhouse work soon. 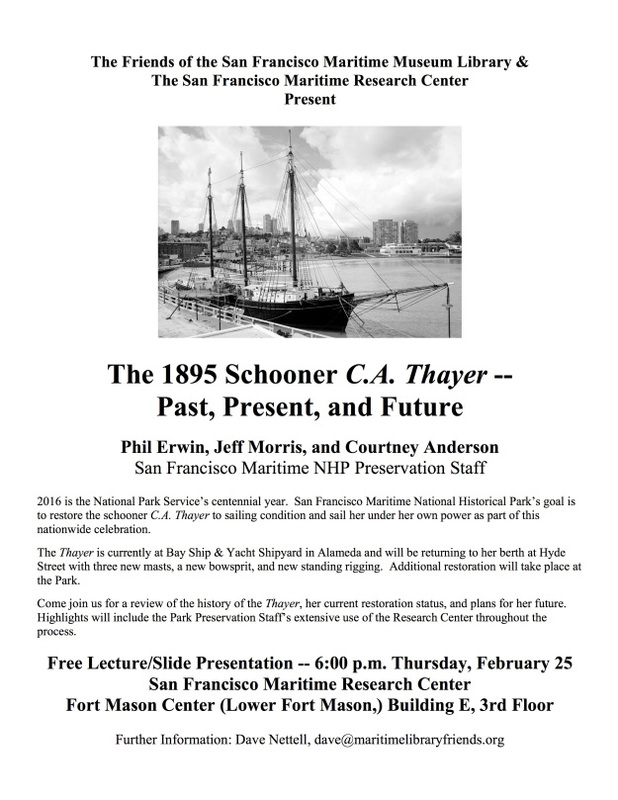 Coming up on Thursday, February 25, there will be a presentation the Thayer by three members of the National Park’s preservation team at the Maritime Library in Lower Fort Mason at 6:00 PM. This event is FREE TO THE PUBLIC. Below is the flier for the event. Don’t miss it!